One moment, Doctor Greg Brulotte is one of the best ER doctors at busy St. Joe’s Hospital, although he has a reputation for terrorizing the nursing staff. The next, he’s a patient in intensive care, and he’s even more of a tyrant. ˃˃˃ Nurse Lily Sullivan is one of the few nursing staff who ever stood up to Greg. She’s well aware of his reputation as a womanizer, and she’s determined not to fall for him. Besides, her life is much too complicated for romance. Her grandma, who lives with her and her brother, has Alzheimer’s, her brother is fighting a custody battle over Lily’s niece, and an accident in the ER could mean both she and Greg are in for the fight of their lives–unless the nursing staff assigned to his case murder him first. ˃˃˃ He’s the worst patient any of them have ever had to deal with. Lily is the only one who can help Greg recover. Can she do it without losing her heart? YOU’LL LOVE NURSING THE DOCTOR! You’ve heard that doctors make the worst patients. All my female nursing friends told me it was no myth. Their worst nightmare was to have a doctor as a patient. Since strong conflict makes for strong plots, it simply had to be done. 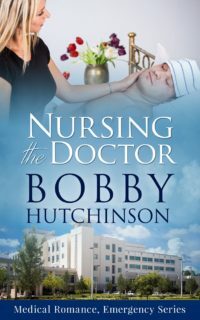 Take one great doctor, a bad accident, and a couple of nurses who’ve been around the block a few times—and NURSING THE DOCTOR becomes a challenge instead of a nightmare.